This very unique ring by Michael Chang is crafted in 18k white gold and adorned with brilliant, near colorless Diamonds SI(g-h). Four princess cut Diamonds 0.57 tw and five round brilliant cut Diamonds 0.45 tw are bezel set in a stylishly textured band. Full diamond weight is 1.02ctw. 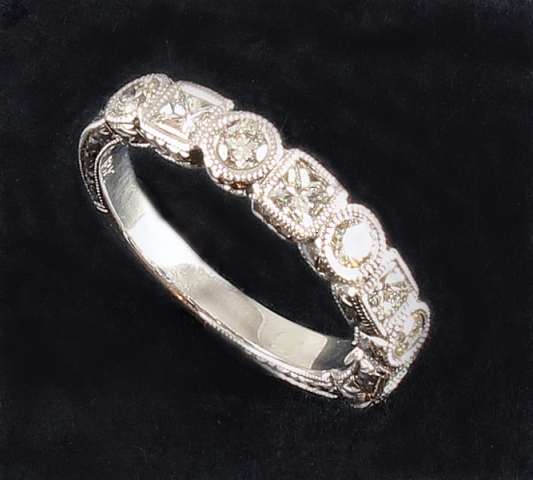 This ring is in stock and can easily be sized to fit. Please specify your ring size. Available in half sizes 5 - 8.